(Arutz 7)The Trump administration’s ‘Deal of the Century’ to promote a final status agreement between Israel and the Palestinian Authority includes plans to reunite the Hamas-ruled Gaza Strip with the Palestinian Authority, a senior White House official said Tuesday. White House envoy Jason Greenblatt reveals Trump administration's plans to reunite Gaza Strip with Palestinian Authority. The Trump administration’s ‘Deal of the Century’ to promote a final status agreement between Israel and the Palestinian Authority includes plans to reunite the Hamas-ruled Gaza Strip with the Palestinian Authority, a senior White House official said Tuesday. While details of President Trump’s ‘Deal of the Century’ to achieve a lasting peace in the Middle East have yet to be released, White House special envoy Jason Greenblatt revealed in an interview with Yediot Ahronot Tuesday that the plan includes a provision for Palestinian Arab unity. "Let’s be clear about something: Gaza and the West Bank have been separated for 10 years, not only physically, but politically—between the Palestinian Authority and Hamas. It’s absurd to deny that reality," Greenblatt said Tuesday. Greenblatt did not reveal further details of the White House peace plan, which has yet to be finalized, but implored all parties involved to withhold judgment until the specifics of the plan are released. "Once our plan is released, all parties should read it and judge it by its merits. 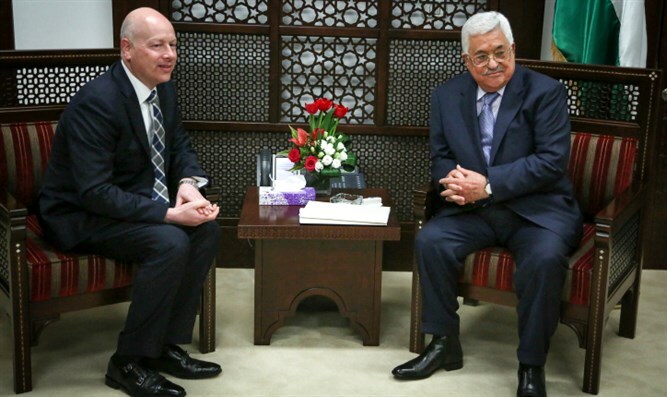 The PLO should be a positive force to change people’s lives for the better, and not try to sway people before they have even seen our plan," Greenblatt added. Former Israeli Ambassador to the US Michael Oren (Kulanu), who now serves as Deputy Minister in the Prime Minister’s Office, said the White House’s plans to bring together the Gaza Strip and Palestinian Authority testified to the governments seriousness in pursuing a final status agreement. While the Gaza Strip was included as part of the Palestinian Authority under the terms of the Oslo Accords, the coastal enclave has been ruled by the Hamas terror organization, following its takeover of Gaza in 2007. Despite reconciliation talks between Hamas and the Palestinian Authority, culminating in the signing of a full reconciliation deal in 2017, Gaza has remained under de facto Hamas control, leading the Palestinian Authority to withhold payments to the Strip, including purchases of electricity from Israel.